A program of shorts by the artist couple Melissa Dullius and Gustavo Jahn with some new and rare films, some German and Berlin premiers. 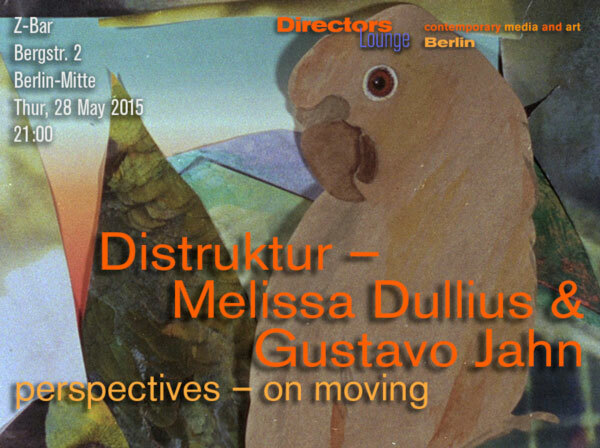 Distruktur — Dullius and Jahn — claim a space fluctuating somewhere between the big and small cinema. Consequently working with analogue film while shooting and mostly also developing their own material, their films seem to create a kinematic time-space that is distinct from the ordinary even though they often use film settings of daily life. Some films will be screened as video, some as 16mm. The artists will be present for Q&A. Curated by Klaus W. Eisenlohr. The Sound We See: Berlin	LaborBerlin sucht wegen Kündigung ab sofort neue Räume! / Due to eviction LaborBerlin is looking for a new space!